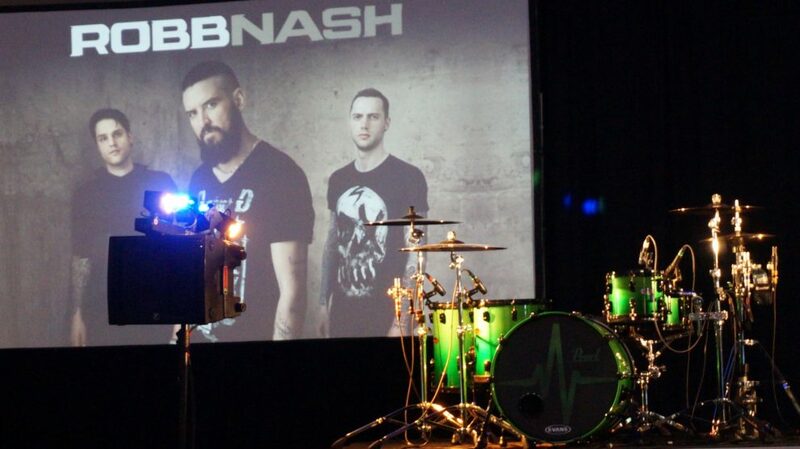 Robb Nash and his team are touring across Canada, performing in high schools and other venues, offering a powerful message of hope to teens. Recently Robb Nash and his band invited me to attend one of their performances at a local high school. Robb and his team are touring across Canada, performing in high schools and other venues, offering a powerful message of hope to teens. The band has held 750 performances in the last 6 years, reaching 1250 schools and over one-million young people (source). I reached out to Robb’s team to commend them for the work they are doing and find out ways we at Libero can support them. I was honoured when they reached back to me and invited me to attend one of their performances at a local high school. The team told me these small venues offer the most intimate and raw experience out of all the performances they do, and I am so grateful they welcomed me into their world for an afternoon. Will I be drowned out by a mass of reporters or will I be the only one there? Will I get to meet Robb and the team? Will anyone talk to me at all? The unknown brings up severe anxiety as I exit my vehicle and walk towards the school. I enter the office and am rushed down the hall with the principal and counsellors towards the gym. I hang low when we get to the gym, unsure of my place. The stage is set up and Robb and his band are doing sound check. I slowly gravitate towards the circle when Robb and his team come over to talk to us. The team spends several minutes briefing the school staff on what to expect from the performance. It becomes clear to me in this moment that the top priority of Robb and his team is the experience and well-being of the students. The team has systems and signals in place for everything. They are well-prepared for the potential emotions that may arise from students both during and after the concert. Everyone is reminded that long after the band is gone, the students will still be there, living their lives, and needing support. Unsure if I am imposing, I back away once the brief meeting is complete and hang low. Robb notices me and comes over to chat. He asks about Libero and our magazine and listens to my story. While speaking with Robb I feel an immediate sense of warmth and acceptance. I am the only “media” in attendance, yet I don’t feel like an outcast at all. I feel completely welcomed into this world I’d been so anxious to set foot into. As Robb and I continue to speak, more members from his band and team join in the conversation, each person sharing the same genuine spirit that Robb offers. In this moment I see just how unique Robb and his team really are. Soon the students come in and the show begins. Now I get to see the band in action. Robb has a way of connecting with students, and I think it’s because they know he’s the real deal. There’s no “show,” no “performance,” no facade, it’s just him: open, real, and honest. The presentation is a combination of music, talk, and video. Robb shares the story and meaning behind each of his songs, which are based on his own experiences and the stories of those he’s come across. Robb’s drummer Jonny Holliday also shares his story along with his struggles with depression and why being a part of the Robb Nash Project is so important to him. What I admire most is the fact that Robb welcomes others into his concerts. This isn’t “The Robb Nash Show.” This is a community made up of many people and many stories. Videos run throughout the presentation of students sharing what they’ve gone through and how they’ve found hope. Parents of teens who died by suicide are given a place to share in the videos, opening their hearts and expressing why what Robb and his team are doing is so important. Even members of the audience are engaged. One student was even given the opportunity to come up on stage and sing to everyone. It is clear that Robb and his team want every student to feel noticed and important so they leave knowing they have something to offer the world. “You’re here for other people,” Robb reminds the students. 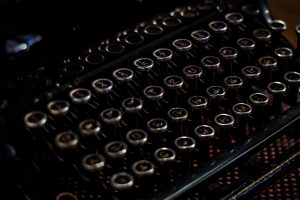 His words are powerful as he shares, and an encouragement to many who can relate to his story. Robb reminds students of this fact. He wants them to know that it’s okay to not be okay. It’s okay to hurt and it’s okay to struggle. Amidst the pain, however, you need to remember that just as pain is there, strength is there, too. Through these concerts, Robb reminds students of the strength they have and helps them reach down inside themselves to access it. After the show, Jarret Hannah (VP Programming & Communications) shares with me the importance of connecting with others and sharing your inner strength. He says that’s what the Robb Nash team is doing; they are taking the strength they’ve received from others in their lives and passing it on. I feel both encouraged and empowered by this conversation, and it further underscores the significance of their project. I also meet Karli and Sean from Bold as Lions. Karli and Sean tour with Robb and have a unique purpose of their own. A husband and wife team, they tour and perform to raise awareness for social issues and support charities who are working towards social good (learn more at boldaslions.ca). Karli is kind and encouraging. 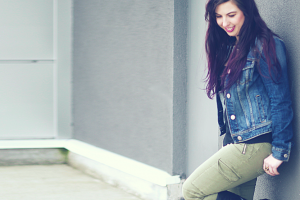 She has a strong passion for social justice and leading others into action to create a better world. Before leaving, I have one final conversation with Robb. He offers me one of his bracelets and a note. 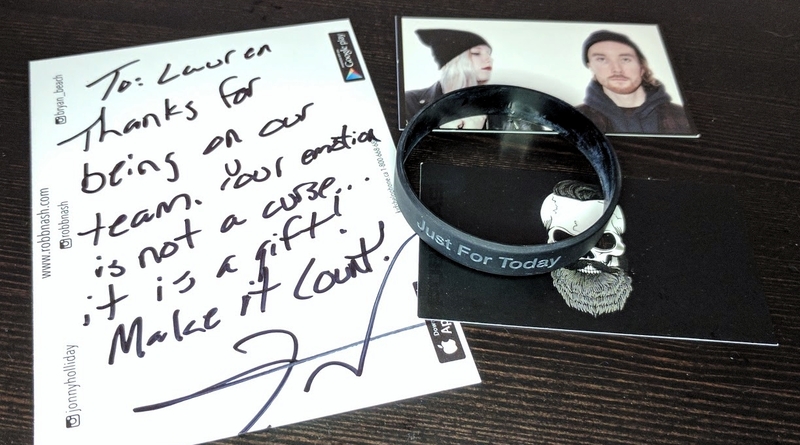 Each time I see the bracelet it reminds me of Robb and his team and the gift of strength they offered me. I will not forget this experience and I am forever grateful. Download Robb Nash’s app on Google Play and on the iTunes store. Purchase Robb Nash’s music on iTunes. Purchase Bold as Lion’s music on iTunes. A big shout-out to Robb, Karli, Jarret, Tyler, Jonny, Sean, and the entire Robb Nash Project team. It was an honour to meet you! On behalf of myself and Libero, thank you for everything you do to bring a message of hope to those who need it. 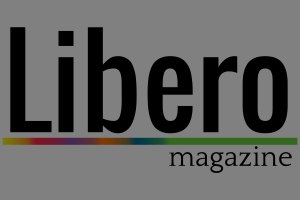 Become a Guest Writer for Libero Magazine!